From 8th August to 7th September 2015 is the seventh month of the year of the Wood Goat (Yi Wei) with the ruling energy of #8 in the central grid. East – The qi influence in the east in August indicates excellent career opportunities and performance and meaningful promotion. Children should try to use this area for studies as it promotes academic achievement and is good for examinations. This area is superb for business and if you have an important room like an office, lounge or especially a main door you will notice an upbeat trend in the month of August. This is also a great area for those in studies. Students will do better if they use this room for their studies. To further enhance, place a crystal globe on their work desk. North – A very auspicious sector in 2015 made more favourable by the visiting 4 enticing romance for couples, newlyweds and for those who are looking for love and affairs. Activate this area by using it regularly to enhance the qi. (Do not activate this corner with any water feature). You should place some romantic symbolic items like a pair of Mandarin Ducks or a hugging couple in the north this month to enhance romance. Northwest – This is also a good area for children to study and prepare for examinations. It is a very good area for romance in August with this special combination, for those with a bedroom in the northwest you can expect sparks to fly. To make the most of relationships this month, you should place some romantic symbolic items like a pair of Mandarin Ducks or a hugging couple in the north this month to enhance romance. Central palace – Because the central palace has an auspicious #8 monthly star this makes a smother month in August. If you have a bedroom or office located in this palace and are engaged in negotiating new ventures and businesses, you may feel that the element is with you. Those involved in politics will also see success. The benevolent qi of this palace is very strong in this palace so make good use of this area as much as you can. Southwest – The southwest is where the Five Yellow resides. Avoid any repair work, renovations, breaking ground or felling trees in this sector this month. If activated, its influence can and will create problems, obstacles, accidents and illnesses for the residents or the business. As you know I do not normally like to recommend a product cure but a Wu Lou, six Chinese coins tied with red ribbon or six rod metal wind chime is very effective here. Use another door if this is your front door is in the SW. If you have a bathroom or cloakroom here or any room you do not use much this is good news and no cure is necessary. Avoidance is the best cure for this combination of qi. If you cannot avoid using this room, make sure that metal cures are in place like a six rod hollow metal wind chime a Wu Lou and/or six Chinese coins tied in a row with red ribbon. Use metal such as gold, copper or brass. You can use whatever still metal objects you have got handy in your house but do avoid objects that are sharp or menacing looking. Do not place any red, pink or orange colours in this area or anything triangular or square in shape. If there are external poison arrows, for example, sharp roof lines, sharp images or unfriendly structures pointing at your property from this southwest direction, this may bring fire accidents. Place a Ba Gua outside if your main door is located here. You would be well advised to refrain from using red in the general décor for the month. Place some blue items instead to calm the fiery interaction. South –Be careful signing contracts in August especially if you have an important room in the south, as the influence in this palace carries with it possible law suits and arguments especially with partners (romance or business). 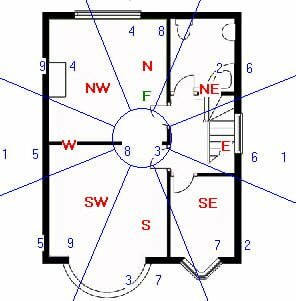 If the south part of your home or office is a bathroom, cloakroom, utility or other similar less important room you do not need to do anything and do not read further. If the south is a main door, bedroom, lounge or any other important room you need to take care. For my home as an example the south is where my office is located and I have purposely made sure I am out of the office more in August with most of my overseas consultations booked, obviously we cannot control it completely as people will still be calling at my office and I will have to use it at some time, we will just use it less, AVOIDANCE IS THE BEST CURE. You can place a piece of red cloth here for the month to try and calm things, you can introduce this colour with doormats, rugs, bed covers etc, remember the negative part is just a passing influence so do not start repainting the room red as next month you will not want this colour, as the red if left in place in September will cause you many problems and this is why you should check back each month. Northeast – If your bedroom is located in this sector of the house, do not be surprised if you find yourself feeling a little under the weather this month. The visiting of the monthly #2 Black brings with it illnesses affecting the occupants of the bedroom. You can place a small metal (golden) wu-lou by the bedside table to dissipate some of the malevolent influences of earth element 2 Black. If this is your bedroom or office, you can place some metal objects in the north corner of the room or place a golden Wu Lou in the northeast corner of your bedroom if your bed is also located in this corner of the bedroom, especially if you suffer from sinus problems. West – Those with main or back doors in this palace must take extra security measures as burglary or robbery is indicated. If your bedroom or office is located in this sector, be careful of what you are signing, especially with contracts, as the influence in this palace carries with it possible law suits. Southeast – A palace deemed unfortunate for the year made more inauspicious by the fiery combination of energy that exists here. Beware of possible fire hazards. Do not leave lit candles unattended if your living room is here. Heart problems may crop up for those who have existing health issues pertaining to the heart. This is especially so for those whose bedrooms are in the southeast sector of the house. Metal cures should be in placed in this sector for the year. Make sure the bed is not located in the southeast corner of the room if this is the only bedroom available. The fire element in this sector this month enhances the earth element of the annual #2 Black heightening the possibility of sickness, so please take extra care in health.